I first went to Madeira with my husband some fifteen years back, but when I returned this spring with my bezzie, The Botanist, it was like I hadn’t been away. Only three and a half hours on the plane – barely time to get drunk, buy expensive scent one may well leave in the seat pocket due to one’s befuddled state, or apologize profusely to the stewardesses for absentmindedly popping one’s head out of the toilet and asking them for a light. There’s no time difference, but it was another world from the cooler weather we left behind; and even in the winter months, Madeira is warm enough to swim in the Atlantic while in summer, it can be hotter than Brazil. On our first day The Botanist remarked on how pleasant the weather was, as we strolled in the sunshine. On the second day she had one of the worst cases of sunburn I’ve seen, her face swollen up like an overcooked sausage, with pricked bits under her eyes. Good look, Botanist! WEAR A HAT IN FUTURE! All the more reason to desert the multitude of pools which link the beautiful, modernist Vidamar Hotel to the deep blue sea (in which whales and dolphins are so close up and personal that boat trips offer you another free go if they should evade you) and make our way to the centre of gorgeous Funchal, the island’s capital. A riot of white houses, black shutters and terracotta roofs, this is Gothic Lite, built on a towering volcanic crater that looms over the sea like an ocean-liner. This, along with the riot of flowers, gives Madeira a fairytale Land-Of-Counterpane look, which was heightened by our trip to Blandy’s Wine Lodge where I sampled the local blend, which I found to be of almost hallucinatory power. Funchal is very walkable, with paths and benches and buildings and friendship bracelets all hewn from the same black volcanic rock; it’s fun to be a proper tourist and have lunch on the balcony of the Cafe Ritz while aeroplaning 20 euro notes to the handsome buskers below, but it’s also nice to see the real Madeira. Always be nice to your taxi driver and tip like a lady (or rather, like ‘a tart, a Jew or a journalist’ – one London cabby’s description to me of the most generous passengers) and he’ll take you to the sort of restaurant so local that it has no name on the bill, literally hewn out of the mountain, full of fish in buckets and fishermen in their cups, where we were given wine, spirits, fish and unspeakably saucy custard pastries for 39 euros. The fish in Madeira is so fresh that one expects it to get up and perform a medley from The Little Mermaid. I even ate LIMPETS here and found them utterly delightful – like mussels that aren’t up themselves. 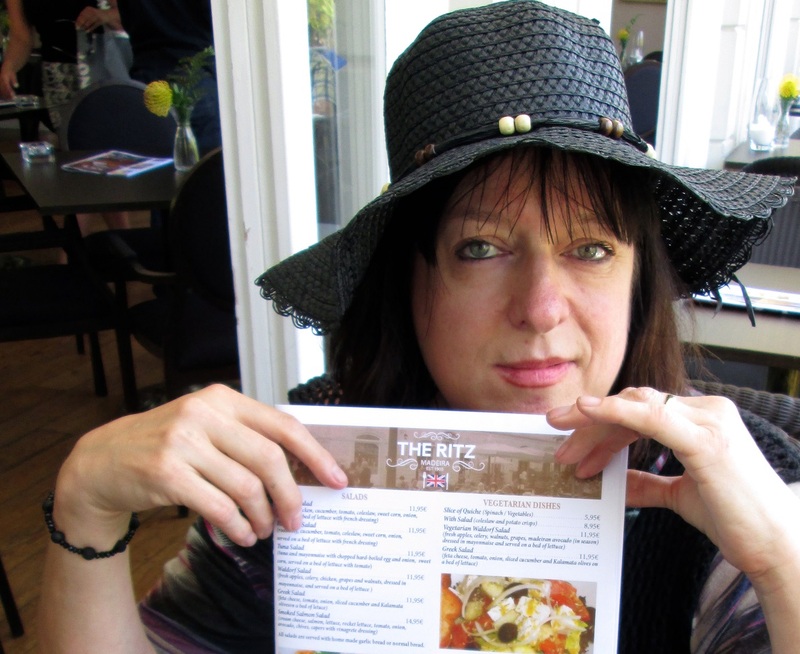 I thought it too cheap and queried the bill – and they took 10 euros off! I tipped massively (like a journalist), of course. If the monochrome charms of the city pall, you can grab a taxi up to the tropical lushness of the Monte Palace estate (you can also go up by cable car and come down by toboggan, but I’m far too rich and fat for all that these days) which was recently voted 13th Best Botanical Garden In The World by Conde Nast Traveller. This was a lovely trip, full of firsts… someone was sick on the tour bus and IT WASN’T ME, someone spilled champagne over me and THAT WASN’T ME EITHER! Madeira is both pretty and dignified – an unusual combo – and though it’s quite a while since I’ve been either, I can certainly appreciate it in others.